Embroidery sewing machines can add beauty and themed detail to anything you sew. The amount you will invest in an embroidery sewing machine has become a huge variable, costing from $300 to $8000, depending on the machine options, the software you purchase to work with designs for embroidery sewing machines, and the size of the embroidery the embroidery machine is capable of stitching out. Some embroidery sewing machines are "embroidery only" machines. These sewing machines are solely devoted to doing machine embroidery. They do not do the work of a regular sewing machine. Other embroidery sewing machines, the higher end of the market, offer sewing machines that can do everything. They usually have a removable embroidery unit, so the machine will meet any sewing need. As always a local sewing machine dealer can be your best source for training. It's always advisable to know what you are looking for before you go shopping. Embroidery sewing machines come with hoops that attach to embroidery sewing machines. Hooping is putting the fabric into an embroidery sewing machine hoop. Stabilizing and tightness are important; unlike hand embroidery, the fabric must stay in the same position while the sewing machine embroiders the design. If the fabric moves, the design will not stitch out correctly. The border not lining up with the rest of the design is a common telltale that the fabric moved. The simplest way to think of hooping is that the hoop is acting as your presser foot as the embroidery sewing machine stitches the design. Embroidery sewing machines use a darning foot that is not actually down on the fabric and there is no feed dog under the fabric to hold it in place. The stabilizer "stiffens" the fabric to hold it taut as the embroidery sewing machine does its work, working in conjunction with proper hooping. There are a variety of stabilizers available with a variety of purposes and uses. Some are used below the fabric you are embroidering; others are used on the top; napped fabric, such as terry cloth, needs a stabilizer on top to hold the nap down and prevent the loops of fabric from poking through the embroidery design. Water Soluble and Heat Away are commonly used as topside stabilizers. Water Soluble will dissolve in water. Heat Away turns to ash with the heat of an iron. Either one will leave no trace of the stabilizer but will hold the fabric down to get the job done. Digitizing is the process of taking an image and turning it into a language that embroidery sewing machines understand, using software that is designed to work with embroidery sewing machines. Once the image has been digitized the embroidery sewing machine understands what to do in order to stitch out the image. Digitizing is not a simple process unless you have worked with computer graphics and have the patience to learn all the intricacies of machine embroidery digitizing. Free-motion embroidery is an art! It does not require embroidery sewing machines. You create your own design and use a sewing machine to freehand draw and fill in your design. The feed dog is dropped, and a darning foot is used. 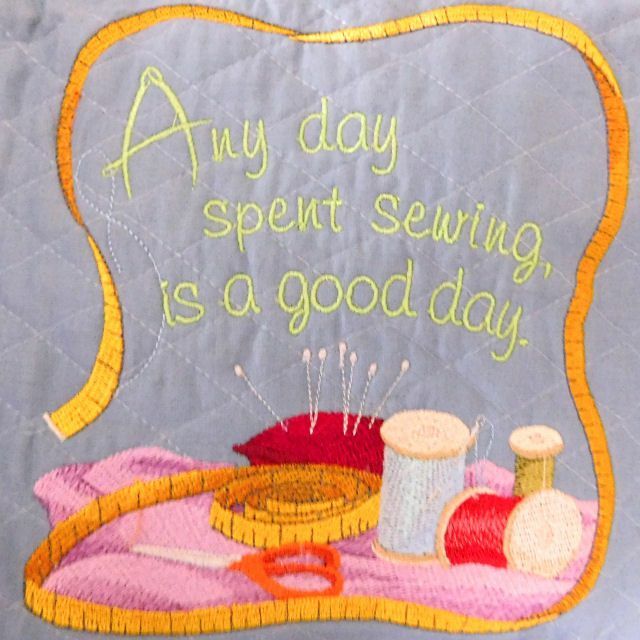 The challenge is to keep your hands moving in unison with the sewing machine to create even stitches. Some companies now offer a "stitch regulator" which makes free-motion embroidery much easier.